Can you leave your business alone for a year and come back to find it bigger and more successful than when you left it? I was sat in a cafe on St Kilda beach in Melbourne, where I lived at the time, when I read this question. It immediately prompted an uncomfortable truth – my consulting ‘business’ would collapse if I left it alone for one month let alone a year. After returning back to the UK, I re-designed Venture Harbour to not just run on autopilot but grow on autopilot (more on that later). I stopped consulting and instead built SaaS tools & products that would generate passive revenue. Why put business on autopilot? When you automate something, it generates consistent results. When you automate something, you trade a one-off time investment for infinitely recurring results, creating less work in the long-run and leveraging your time. This combination of predictability and leveraged time ultimately means less stress, more calm, better results, more free time, faster growth, more profit, and… well, just a deeper sense of bliss knowing that your business can support you doing all the things you want. For me, I always dreamt of off-grid travel, like husky sledding, while having a business running in the background. Everyone has their different motivations, but ultimately I think we all share one thing in common – we want freedom and flexibility. Putting your business on autopilot is the means to that end. 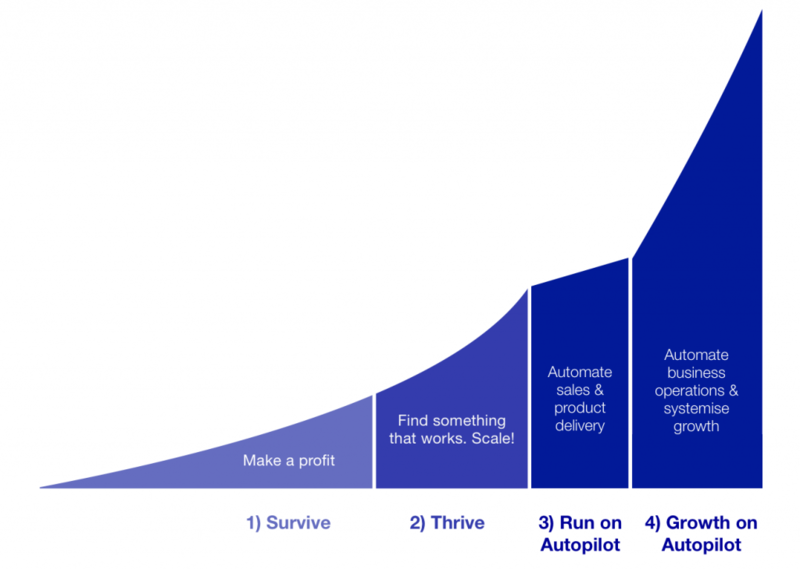 Before you can grow on autopilot, you must first build a business that can survive (i.e. generate a profit and positive cash flow) and then thrive. The goal here is Growth on Autopilot, which I define as being the point at which you can leave your business alone for a year and come back to find it bigger and better than when you left it. Run on Autopilot, on the other hand, is the point at which you can leave your business alone for a year and find it more or less where you left it. In other words, your sales engine has consistently generated X sales per month and the product/service is being delivered without your involvement. The gap between these two steps is not small. Growth on Autopilot requires you to have automated or delegated virtually all aspects of business operations (finance, HR, sales, admin, product delivery, customer support) in addition to having built a marketing engine that is constantly identifying, prioritising and executing marketing strategies to grow the business without you. That said, getting your business to run on autopilot shouldn’t even be attempted if you haven’t yet built a business that can survive and thrive. Automation is a force multiplier. Automating a lousy unprofitable business often just magnifies the lousiness. Automating a highly efficient business magnifies the efficiency. When we launch a new venture at Venture Harbour, we deliberately spend the first year or so in a scrappy/agile state with very few systems. I recommend this approach as it’s important to have as little rigidity early on while you’re still figuring out what works. Below are three of the most helpful strategies I’ve come across in getting Venture Harbour and its ventures to reach Growth on Autopilot. 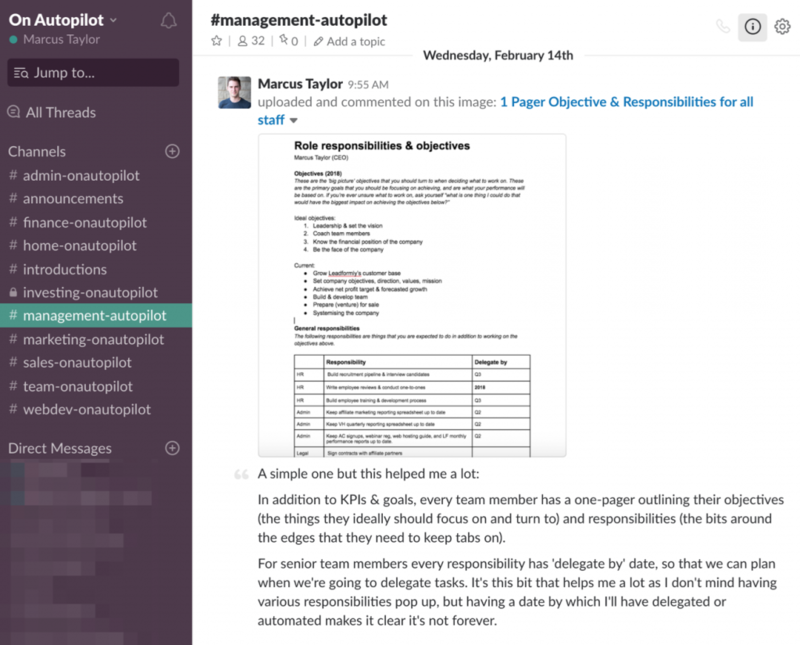 If you’d like more practical ideas, I run an invite-only Slack community called On Autopilot, which is full of high-functioning business owners sharing their processes for putting their business (and life) on autopilot. If you run a business and would like to join, you can apply here. You can put my name (Marcus Taylor) as your introducer. Before you search for ways to automate your business, eliminate the unnecessary. 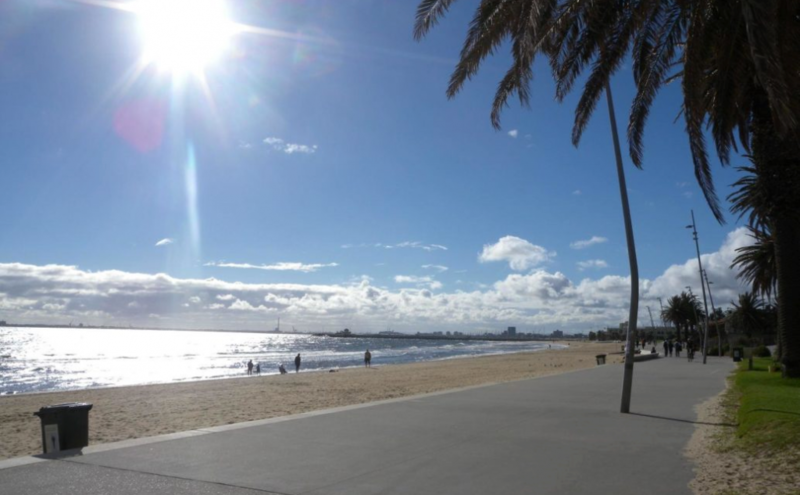 Do you really need an office, or could you work remotely? Do you really need a company Whatsapp, landline phone, Skype, GoToMeeting, and Slack – or could you just have all your communication in one place? Elimination should be the first step in improving your business’ efficiency as, frankly, most things we do as businesses are just not that effective in the first place. Before delegating tasks to staff or a VA, automate as much as possible. Automation is more cost-effective and consistent than delegation over the long-run. It does, however, lack creativity. Some tasks, such as creating design briefs or defining your marketing strategy, are often best delegated rather than automated. Eliminate. Automate. Delegate. In that order. 2. How much is your time worth? All business owners spend some time working on tasks worth less than £10/hour. We also spend some time working on tasks likely worth upwards of £5,000/hour. Everything in the first two columns should go on your to-delegate list (explained in a moment). The more time you’re spending on tasks on the right, the more value you’re adding to your company and the faster you’ll grow. To-do lists are great, but I prefer my to-delegate list. Rome wasn’t built in a day and neither are great businesses. There are probably many aspects of your business that you have no idea how to automate. That’s fine – it was (and still is) the case for me in many aspects of my business. So what’s a to-delegate list? It’s a one-page document listing all of the tasks and responsibilities you do as a business owner. Next to each task is a date by which you’ll delegate that responsibility to someone else. Your to-delegate list takes the pressure off having to automate/delegate everything now. It helps you acknowledge what you need to systemise, and then gives you the time to explore ideas, while making a commitment that you will have found the answer by a given date. When I pivoted Venture Harbour to a more automated business model, I really struggled to find a network of business owners tackling similar challenges. Putting a business on autopilot is hard. There are technological hurdles, strategic hurdles, and enormous psychological hurdles to overcome. But the stakes are massive – if you can untether yourself from the growth of the business you can achieve so many incredible things. If you’re facing similar challenges in your business and want to learn and be inspired by a group of like-minded business owners who’re going through or have been through the same thing, the On Autopilot community is a great place to start. 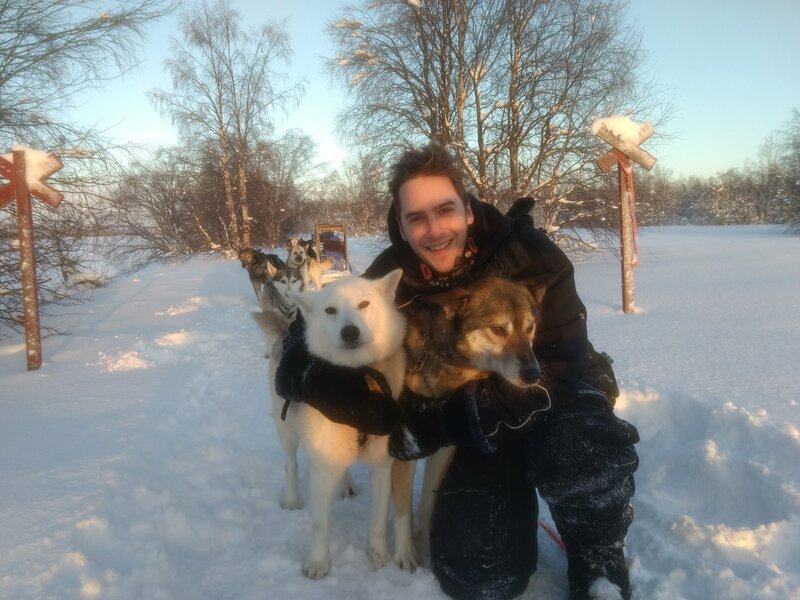 PS – A few months ago, I finally went off-grid to mush huskies through the arctic wilderness. Coincidentally, Venture Harbour had its best month while I was away (or maybe not a coincidence…)!